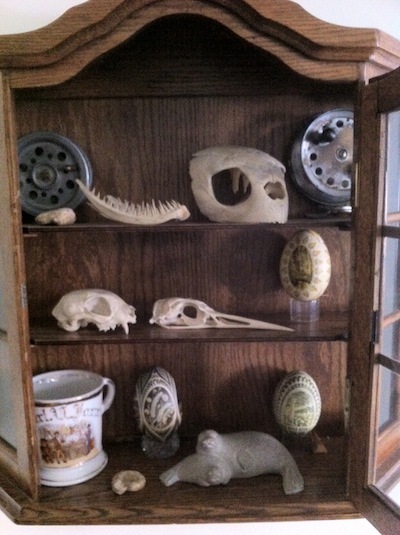 "Various animal skulls around both my parents' home and my sister's." A link to a legal forum regarding the legality of owning bones in the United States. This is the nightmare gerbil looking for a good home. Email hodgman@maximumfun.org and tell us in 100 words why YOUR home should be that good home. Cats Not Kids is a fine life, but if you have a purebred cat such as an Abyssinian, you probably shouldn't be throwing around the term "breeder" as an insult. Just sayin'. Jesse! This is not a gerbil! It's a squirrel!!! Judge Hodgman, I do recall the Karen Black Trilogy of Terror. Michael Chabon's new book makes a reference to it. By all means read it. I'm getting the the corner of my bedroom ready where I'm going to cower in dismay after listening to the Skull Podcast. I just wanted to tell you how much I enjoy the Judge John Hodgman podcast before I retreat from society. I cannot express how satisfying it was to me when John hit the "Nightmare Goebbels" joke. I was in my car on a gray morning, shouting "IT'S NOT A NAZI PROPAGANDA MINISTER, IS IT?" and I honestly thought the moment had passed. So happy now. I am a scientist. I have seen many animal skulls and remains in my time. I never screamed at any of them... Until I saw that nightmare gerbil, which is actually a squirrel. That thing is just unnatural. I am regrettably bowing out of this contest. On the other hand, that pelican skull looks pretty cool. Am I the only one who think that nightmare gerbil looks like a squirrel with a thin tail instead of a gerbil? I would rather write you 100 words on why I SHOULDN'T have that thing in my home. Wait. Is that not a squirrel? Love love love the podcast but three married couples in a row? Please intersperse them with friends, coworkers, siblings, parents and children - anything but more tired passive/aggressive spousal issues. "For me, the best episode in a long while..." he said lovingly.